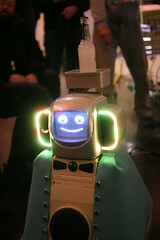 I’m taking off on Sunday for a week in Austria, mostly in Vienna to attend and cover Roboexotica, “the festival for cocktail robots”. I’m super psyched to be hanging out with new and old friends as they compete with their robotic creations in areas of expertise such as ‘robots that mix and service cocktails’, ‘robots that light your cigarette for you’, and ‘robots that engage in bar conversation’. Then I head to Graz to give videoblogging workshops to university students and give a multimedia slideshow presentation on weird techno-art San Francisco. Drop me a line if you’re also gonna be around in Vienna or Graz.